Ah Petra! Nicknamed the Rose City and one of the wonders of the world, Petra is a vast city carved into rock by the Nabateans, an ancient Arab civilization. Don and I had been to Petra in 2008 on a day trip, crossing from Eilat, Israel into Jordan. We’d had a less than wonderful visit: long border crossing times, lousy guide, much colder temperatures for which we were not prepared. This time, however, was a totally different experience. We were properly dressed for the sunny but crisp day and had a terrific guide. Also, there were hardly any other people there in the early morning–both because tourism in Jordan is down and visitors doing a day trip from elsewhere don’t arrive until mid-day or later. From Tanzania we flew five hours to Aqaba, Jordan. En route we had the pleasure of sommelier service from Captain Ben. Our lunch was beautifully prepared, as usual. Look at the presentation of this zucchini, black bean, and arugula appetizer! We got a fairly early start to our exploration of this lost city, which was abandoned from the seventh century AD until John Lewis Burckhardt discovered it in 1812. From the entrance place we walked about a mile to Al Siq, the narrow canyon that leads to the city itself. Along the way are the stables from the horses and donkeys that take riders into an out of the site. The rocks here are a photographer’s delight, as the play of light changes throughout the day. I was continually stopping to take more photos, sometimes lagging a bit behind our group. Don kept track of my whereabouts, although there wasn’t much chance of getting lost–one road in and the same way out. Petra means The Rock in Greek, and it easy to see how it got this name. The Siq is a crack in what was one mountain and carved by water and wind–as were many of the rock formations we saw. You get a sense of the grandeur and scale from this picture of Don in the Siq. Amazingly a few plants grow out of the rock, including the caper tree. The city itself is half-built, half-carved into the rock. The walk to reach the city is another mile or so. Along the way we were greeted by a group of “Nabatean” guards, who were happy to post for photos (for a tip, of course). Now for some history. The earliest settlers in this area date back to prehistoric times, Because of its location in the Fertile Crescent, where three continents come together and between the Dead and Red Seas, Petra became an important caravan stop on the silk, spice and other trade routes that linked China, India and southern Arabia with Egypt, Syria, Greece and Rome. 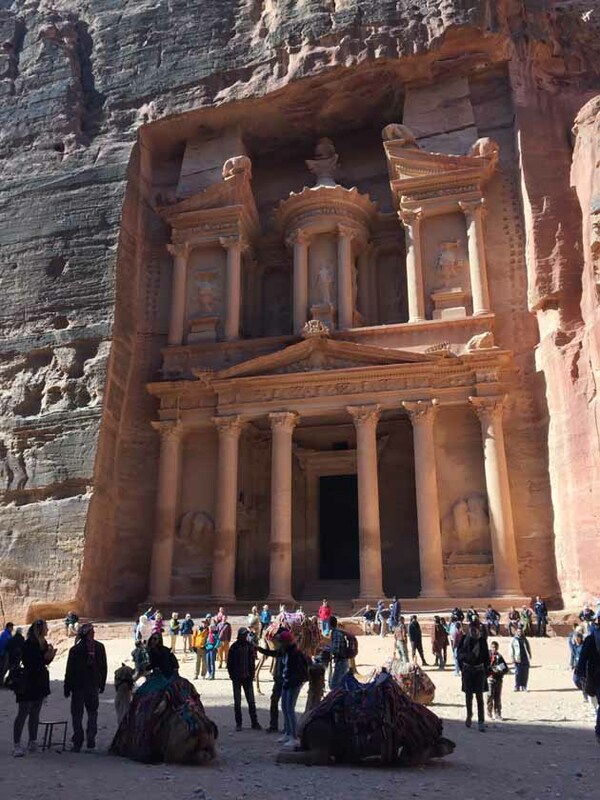 After the Nabateans, the Romans took over Petra’s administration in 106 BC. During the fifth to seventh centuries settlers from Byzantium left their mark on the city as well. The design and features of the city display advanced engineering and architectural skill. The extensive water conduit system made settlement in this desert climate possible. Water channels were carved into the rock and decreased at a carefully calculated slope to keep the water moving at the right flow rates. Such complex hydraulics calculations were not again seen until about 2000 years later! At the end of Al Siq is Al Khasneh, the Treasury, first seen through the rock chasms. Here we see the Greek influence in the Corinthian capitals on the columns. Carved out of solid rock, the 40+ meter Al Khasneh is actually a tomb. It became known as the Treasury because legend says that pirates hid their loot inside a huge urn on the second level. In the first picture below, you can see the hand- and footholds the artisans used to reach the upper levels to carve the architectural masterpiece. We saw evidence of Egyptian, Greek, Roman, and Byzantine influences on the architecture as we walked through the city, as well as the earlier, simpler tombs. It was easy to see why Petra is a UNESCO World Heritage site. When we reached the end of the city, we revived ourselves with a sumptuous lunch buffet. To walk it off, I continued up to a Byzantine church site with remarkably well-preserved mosaics. I rejoined Don and we began the long walk back. We stopped to marvel at this rock formation carved by Mother nature. Depending on where you stand, it is either a fish (side view) or an elephant (front view)! We ran out of steam partway back–we’d already walked at least 5 miles (or at least I had)– and chose to ride donkeys the rest of the way. It was well worth it! Breathtaking photos, Marlene. Petra is a photographer’s delight The water channel system was remarkable, so early on. And very interesting architecture. Our oldest son is an architect, specializing in historic preservation. It would be wonderful if he could see these things abroad. Thank-you for sharing these beautiful pictures! I hope he can make it to Europe and places like Petra, too, Judy. Yes, the water system was amazing; in one place the channels go way up high above the buildings. Wow! You are right. The rock formations are so photographic. You took some amazing pix. Enjoyed th history lesson. Thanks, Linda. We thought Petra was good the first time, visually. This time we got a much fuller experience overall. Looking forward to seeing you in a week! It’s such a gorgeous place, Linda. Hope you get to see it one day. Marlene, you continue to amaze me. I love your writing and photographs. I’m sold! Next visit to Israel (November 2017?) I will make it my business to visit Petra. The water conveyance system is incredible, and the visual splendor is beyond superb. Thanks so much, Judy. Your comments mean a lot to me. I am so glad you are enjoying my reports. And yes, do go to Petra. Just be sure to dress warmly; it’s already cool in November! Sounds like an amazing trip! Beautiful pictures! It was, Maya. I will follow up with recipes from several of the places as well. Petra is on my bucket list. Thanks for sharing your experiences! Thanks so much for stopping by, Gail, and checking out the blog. Petra is a special place. I plan to get back to posting more regularly soon. I’ve taken way too long to finish the trip…Only one more stop to do. I enjoy your postings and am amazed at what you turn out in your Cambodian kitchen! What an awesome post, loved hearing and seeing about your time in Petra. I vote that the rock formation is an elephant!